Motorist route-planning in the 1920s era. Homepage. This page: In the days before sat-nav, this is how the vintage motorist planned his or her route. Before motoring became commonplace, many people rarely strayed from their immediate locality. 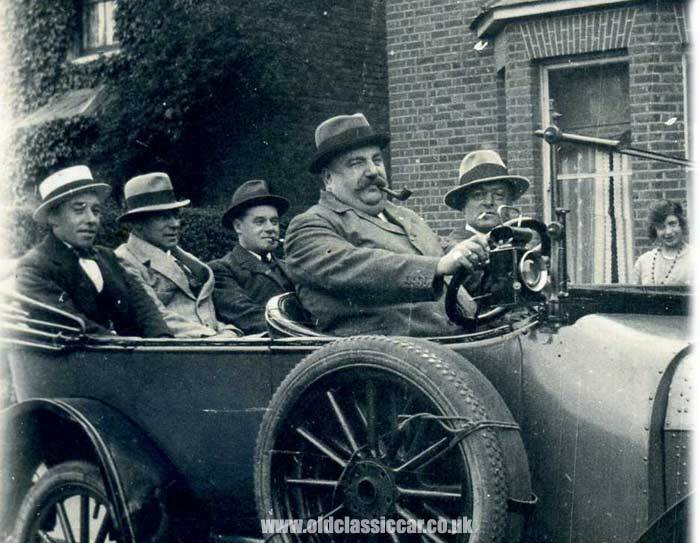 As affordable motor-cars and cycle-cars brought the option of buying a horseless carriage within the reach of the middle classes, so the number of people choosing to enjoy a day trip out by motor increased. No longer were they restricted to routes offered by the rail companies and char-a-banc operators, or to local trips only by carriage or bicycle. The possibilities offered by the automobile were keenly grasped by adventurous souls, wishing to broaden their horizons, even if only within the confines of our shores for the majority. Once a car had been purchased, and one had grasped the basics of handling one's machine, there still remained the tricky issue of finding one's way to the desired destination. Passengers were usually pressed into the role of navigator, often with a clutch of motoring maps to reference both before and during a road trip. Not everyone though could read a map capably, and the idea of sat nav - when few homes even had a wireless set - was the stuff of fantasy. Happily help was at hand. Various motoring organisations in the 1920s and 1930s introduced route planning services, the Automobile Association (AA) and Royal Automobile Club (RAC) being perhaps the best known. The leaflet featured here was produced by the Touring Office of the Michelin tyre company in the 1920s. Routes were provided free-of-charge, and an example route was printed within this leaflet, designed to direct the motorist successfully from Kendal to Keswick, a journey of 38.5 miles. Given that many cars at the time could barely crack 40mph without things getting a little frantic, a journey of this distance - especially when the hills of the Lake District were taken into account - could easily have taken two to three hours to complete. 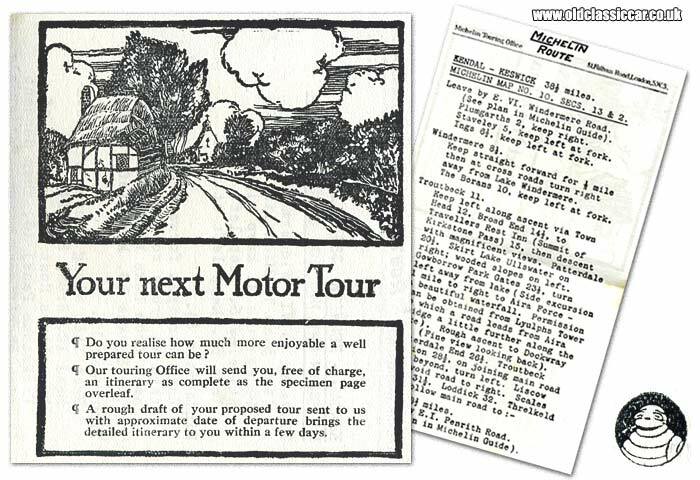 To obtain a free route guide - a service available to any motorist "... irrespective of the make of tyre you use ..." - the interested motorist simply had to draft out a proposed tour, and then contact the Michelin offices, either by writing to their Fulham Road address, telephoning them, or sending a telegram to Pneumiclin, London. A typewritten guide would arrive on one's doorstep within a few days, courtesy of Michelin, who no doubt hoped that their name would be on the driver's mind when next a set of tyres and/or tubes was required for their car(s). No road numbers were given, just simple directions and mileages, with quaint instructions such as "keep left at fork" and "rough ascent to Dockwray" to keep the navigator on his or her toes, shouting out instructions to the driver as necessary. Fine and magnificent views were pointed out, as were tips on nearby places of interest. Planning a trip was something that required plenty of advanced planning in the vintage era, unlike today where a quick look at an online route-planner or simply tapping postcodes into a sat nav is all that is required. More items relating to motoring in the olden days may be found in the Motoring Collectables section.